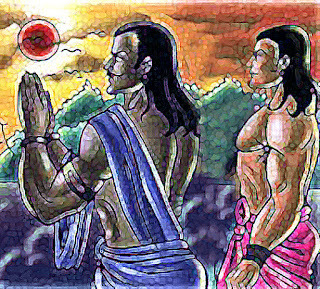 Sanjaya said,--"Beholding Dhananjaya then to take up once again (his) arrows and Gandiva, the mighty car-warriors (of the Pandava party) uttered a tremendous shout. And those heroes, viz., the Pandavas and the Somakas, and those who followed them, filled with joy, blew their sea-born conches. And drums, and Pesis, and Karkachas, and cow-horns were beaten and blown together, and the uproar made was very loud. And then, O ruler of men, there came the gods, with Gandharvas and the Pitris, and the hosts of Siddhas and Charanas, from desire of witnessing (the sight). And Rishis highly blessed came there in a body with him (Indra) of a hundred sacrifices at their head, for beholding that great slaughter. Then, O king, beholding the two armies, that looked like two oceans, ready for the encounter and continuously moving, the heroic king Yudhishthira, the Just, putting off his coat of mail and casting aside his excellent weapon and quickly descending from his car, with joined hands, proceeded on foot, eyeing the grandsire, with restrained speech, facing the east, towards the direction where the hostile host was (standing). And seeing him proceed (thus), Dhananjaya, the son of Kunti, speedily alighting from his car, followed him, accompanied by his (other) brothers. And the Lord Vasudeva also followed him behind. And the principal kings too (of his army), filled with anxiety, followed in the same path. Sanjaya continued, "Though thus addressed by his brothers, O son of Kuru's race, Yudhishthira of restrained speech said nothing but continued to proceed. When Krishna was saying this, among the ranks of Dhritarashtra's son, a loud uproar of Alas, and Oh arose, but the other (army) remained perfectly still. Beholding Yudhishthira, the heroic warriors of Dhritarashtra's Son conversed with one another saying,--'This one is an infamous wretch of his race. It is plain that this king is coming in terror towards Bhishma's side. Yudhishthira, with his brothers, hath become a seeker after (Bhishma's) shelter. When Dhananjaya, however, is (his) protector, and Pandu's son Vrikodara, and Nakula, and Sahadeva also, why doth the (eldest) son of Pandu come (hither) in fear? Though celebrated in the world, this one, however, could never have been born in the Kshatriya order, since he is weak and his bosom is filled with fear (at the prospect) of battle.' Then those warriors all praised the Kauravas. And all of them, becoming rejoiced, with cheerful hearts waved their garments. And, O monarch, all the warriors there (then) censured Yudhishthira with all his brothers and along with Kesava too. Then the Kaurava army, having said Fie to Yudhishthira, soon again, O monarch, became perfectly still,--What will this king say? What will Bhishma say in reply? What will Bhima boastful of his powers in battle, (say), and what Krishna and Arjuna? What, indeed, hath (Yudhishthira) to say?--Great was the curiosity then, O king, of both the armies in respect of Yudhishthira. 309. Varayudham is according to Nilakantha, the excellent bow. Yena in verse 8 is equivalent to Yatra.